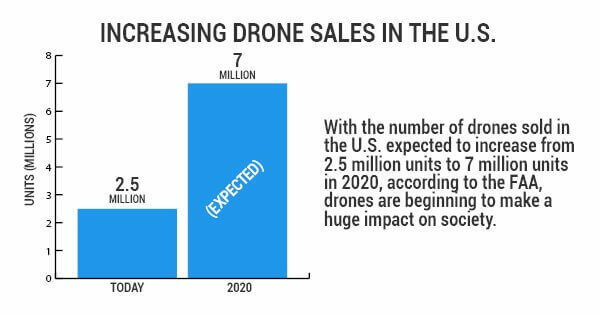 With the number of drones sold in the U.S. expected to increase from 2.5 million units to 7 million units in 2020, according to the FAA, drones are beginning to make a huge impact on society. However, some people are still wary of drones because they don’t fully understand their use. So, this article is going to debunk three common myths about drones to make some clarifications. Drones are only used for invading privacy. Many people have concerns over drones and their use for spying on people. But it’s important to remember that drones are being used around the world for a variety of reasons. They’re even used in agriculture, commercial delivery services, and law enforcement. However, most drones are simply used for fun. While some drones do have fancy camera equipment, not all of them come with cameras. In fact, most drones require expensive camera equipment that not everyone chooses to invest in. So even if a drone does have a camera, it probably doesn’t have great zooming capabilities. So remember that drones aren’t usually used for spying on people. They can take down planes. Most drones can’t even fly high enough to reach the altitude an airplane is at. Additionally, the FAA requires drone users to contact control towers before flying in range, and pilots and air traffic control have to report all drone sightings to a national security system. Furthermore, drones are not allowed within five miles of an airport. Because of the precautionary measures that are taken, it’s very unlikely a drone will even come close to an airplane. And if it does, most drones won’t have the capability to affect the plane in any way. You can hear them coming from miles away. While it is true that some commercial drones make a humming noise that can be heard when nearby, not all drones are loud. Unfortunately, this isn’t always a good thing. For places, like the White House for example, that need to be aware of security threats at all times, noiseless drones could prove to be problematic. But for regular everyday people, noise or no noise shouldn’t make much of a difference unless you’re dealing with a neighbor with an annoyingly loud device. Hopefully, this article cleared up some confusion regarding drones and their use. But it’s essential to remember that if you do get a drone, it’s important to insure your drone. You should insure your drone for a variety of reasons. A drone insurance policy can cover damages either to your drone or property should an accident occur. Furthermore, unmanned aircraft insurance companies can help protect you in the event of an invasion of privacy claim, or personal injury expenses if something goes awry. Even the most experienced fliers have accidents, so insure your drone to protect yourself and your equipment.